Mayor LaGuardia opened the Park Avenue Retail Market under the elevated Metro North railway tracks in 1936. 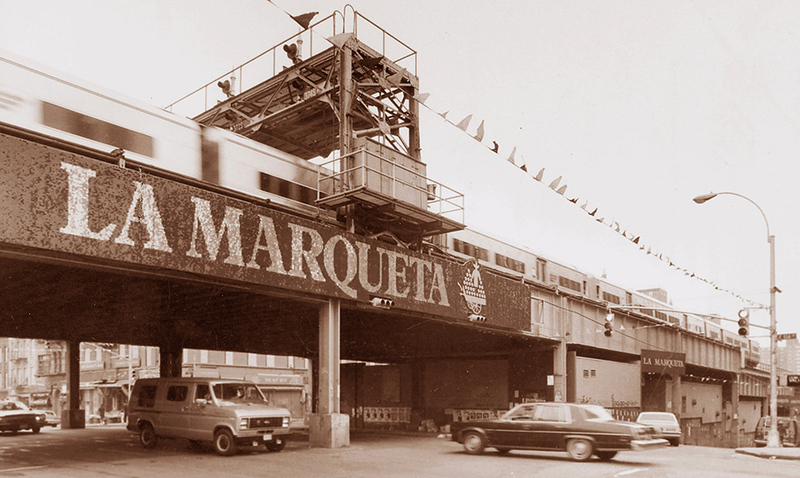 As East Harlem transformed into Spanish Harlem in the 1930s through 50s, the market became known as “La Marqueta.” As a community space between 111th Street and 116th Street in El Barrio, the tradition of culinary, cultural, and community creativity at La Marqueta continues to thrive. On the evening of Wednesday, May 29th, Storefront for Art and Architecture will host its 2019 Spring Benefit, PLACE, at La Marqueta, celebrating the complex relationships between buildings and neighborhood cultures of New York City, Puerto Rico, and elsewhere. The benefit will honor figures who are prominent in the production of art and architectural culture, and will present a silent auction of international artist works; special performances; and a series of installations highlighting the cycles of art, architecture, community, and design. Celebrate the arrival of new Executive Director and Chief Curator, José Esparza Chong Cuy, and inaugurate a new year of programming that will begin on June 1, 2019. Here is your link for ticketing information for the Event. Storefront 2019 Spring Benefit will take place on Wednesday, May 29th from 6-10pm at La Marqueta, located on Park Avenue at 115th Street in East Harlem.